Scriptel Corporation was founded in 1982 and is based in Columbus, Ohio. 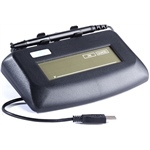 The company quickly became the industry leader in digitizer components and electronic signature capture. In the late 80's, Scriptel launched the PenWriter, the first computer peripheral that provided high quality pen input on a device with its own LCD display. For the first time, this allowed users to see and use their own handwriting on their computers. Today, Scriptel Corporation is the leader in capacitive pen digitizing technology, a very durable and cost-effective way to electronically simulate pen and paper. The company holds many patents and has deployed its technology in over 3 million solutions used around the world, mostly in the demanding retail point-of-sale environment. 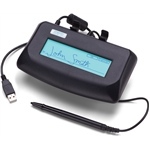 Virtually everyone that used a credit card at major US retailers in the past decade has used a Scriptel pen many times. Beginning in 2010, Scriptel entered the digital workflow market with the ScripTouch ST1500, a dedicated electronic signature pad that provides high reliability with 3 year warranty, and has since launched a full line of ScripTouch signature pads that meet important market needs, backing these up with excellent service and software integration support. In 2016, Aptika has been selected as a Scriptel Authorized Distributor. The Scriptel ScripTouch Desktop Backlit 1X5 LCD - ProScript interface features Scriptel's proven active battery-less tethered pen in a rugged design that will stand up to spills, drops, bumps and all of the other minor mishaps that can happen in everyday use. The ScripTouch Slimline 1X5 USB signature pad with ProScript device interface is the first electronic signature pad for less than $100 that features Scriptel's proven active battery-less tethered pen in a low-profile modern design with a wide, ergonomic palm rest area. The ScripTouch Compact 1X5 LCD USB signature pad with ProScript device interface features Scriptel's proven active battery-less tethered pen and a backlit LCD in a sleek, small form factor design that allows professionals to capture electronic signatures while on the go or anywhere that space is too limited for a standard desktop design. The ScripTouch Slimline 1X5 USB signature pad with EasyScript device interface is the first electronic signature pad for less than $100 that features Scriptel's proven active battery-less tethered pen in a low-profile modern design with a wide, ergonomic palm rest area. The ScripTouch Desktop 1X5 USB signature pad with EasyScript device interface features Scriptel's proven active battery-less tethered pen in a rugged design that will stand up to spills, drops, bumps and other minor mishaps that can happen in everyday use. The ScripTouch Desktop 1X5 USB signature pad with ProScript device interface features Scriptel's proven active battery-less, tethered pen in a rugged design that will stand up to spills, drops, bumps and other minor mishaps that can happen in everyday use. 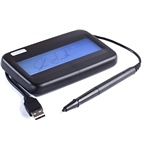 The ScripTouch Compact 1X5 LCD USB signature pad with EasyScript device interface features Scriptel's proven active battery-less tethered pen and a backlit LCD in a sleek, small form factor design that allows professionals to capture electronic signatures while on the go or anywhere that space is too limited for a standard desktop design. 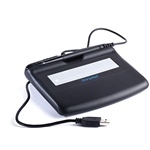 The ScripTouch Magstripe 1X5 LCD USB signature pad with EasyScript device interface is the first electronic signature pad on the market for less than $300 that features an integrated 3-track magnetic stripe reader for all standard cards with magnetic stripe information. 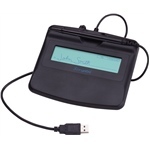 The ScripTouch Magstripe 1X5 LCD USB signature pad with ProScript device interface is the first electronic signature pad on the market for less than $300 that features an integrated 3-track magnetic stripe reader for all standard cards with magnetic stripe information. The ScripTouch ST1570 with ProScript device interface combine ergonomics with a rugged design to deliver a signature pad that is perfectly suited for high transaction volumes and use in serving the public. With it's backlit LCD for immediate rendering and visual feedback, the ScripTouch Slimline LCD is ideal for capturing signatures on the go. 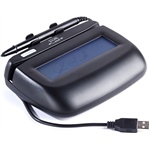 The ScripTouch ST1571 with EasyScript device interface combine ergonomics with a rugged design to deliver a signature pad that is perfectly suited for high transaction volumes and use in serving the public. With it's backlit LCD for immediate rendering and visual feedback, the ScripTouch Slimline LCD is ideal for capturing signatures on the go. The Scriptel ScripTouch Desktop 1X5 Backlit LCD - EasyScript interface features Scriptel's proven active battery-less tethered pen in a rugged design that will stand up to spills, drops, bumps and all of the other minor mishaps that can happen in everyday use.